They are seven simple words we all take for granted. But as Joanne Milne heard her doctor recite the days of the week, she was overwhelmed with emotion, fighting back tears and gasping to catch her breath. Until that moment the 40-year-old’s world had been silent. Born with the rare condition Usher Syndrome, Ms Milne has been deaf since birth and in her mid-20s the condition claimed her sight. 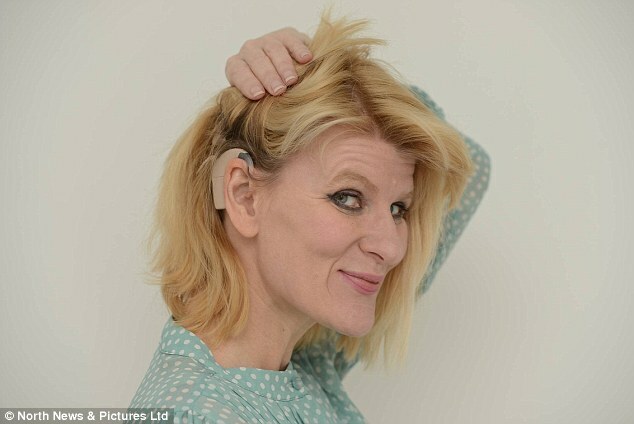 But last month Ms Milne underwent a life-changing operation to fit cochlear implants. Following the procedure, she faced a four-week wait for medics to switch on the implants to see if the operation had been a success. The doctor tells the 40-year-old, from Gateshead: ‘It is a big, big, life-changing day. Ms Milne said the switch-on has been the ‘most emotional and overwhelming experience’ of her life. She said: ‘I’m still in shock now. I have to learn to recognise what these sounds are as I build a sound library in my brain. ‘Hearing things for the first time is so emotional from the ping of a light switch to running water. Since she was diagnosed as deaf, Ms Milne has made it her mission to mentor others living with Usher Syndrome. The breathtaking moment Ms Milne’s implants were switched on was captured on video and shared by Ms Milne’s friend Tremayne Crossley. Moved by her courage Mr Crossley applied for Ms Milne to appear on DJ Lauren Laverne’s BBC 6music radio feature Memory Tape. His application said: ‘Jo has recently had a bilateral cochlear implant in an attempt to restore her hearing, this is being gradually switched on over five sessions. ‘The volume has to be increased slowly to allow the brain to adjust to the new information coming from the ears. ‘Jo told me about a guy who went grey over a one month period due to the shock of hearing how noisy the world actually is. ‘It was with this in mind that Jo asked me to put a playlist of songs together, songs that I thought she needed to hear or that would form an ‘Introduction To Music’ playlist. Mr Crossley chose a song from each year of Ms Milne’s life treating her to Paul McCartney’s Silly Love Songs, Kate Bush Running Up That Hill (A Deal With God), Prince’s When Dove’s Cry, Tracy Chapman Fast Car, Maps by the Yeah Yeah Yeahs and Radiohead’s Jigsaw Falling Into Place. Taking to Twitter yesterday Miss Laverne told her 300,000 followers how Ms Milne’s story had moved her crew to tears.